Researchers with the Climate and Corn-based Cropping Systems Coordinated Agricultural Project (commonly known as the Sustainable Corn Project) have documented 130 findings. 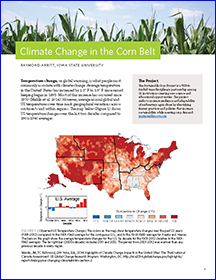 This new publication of findings explains how climate change is impacting and will continue to impact weather in the Corn Belt. Author Raymond Arritt’s research encompasses mesoscale meteorology, regional climate, and aerobiology in the Departments of Agronomy and Geological and Atmospheric Sciences at Iowa State University, Ames, Iowa. You can download the report HERE. We have written quite a bit about planting date effects on corn grain yield (high moisture and dry corn). What about its effects on corn silage? 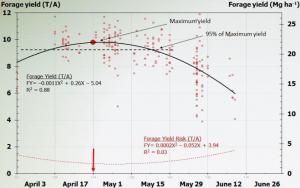 As planting date becomes more delayed, there is an increased likelihood that fields intended for grain will be harvested for silage, especially if the year remains cool. Figure 1. 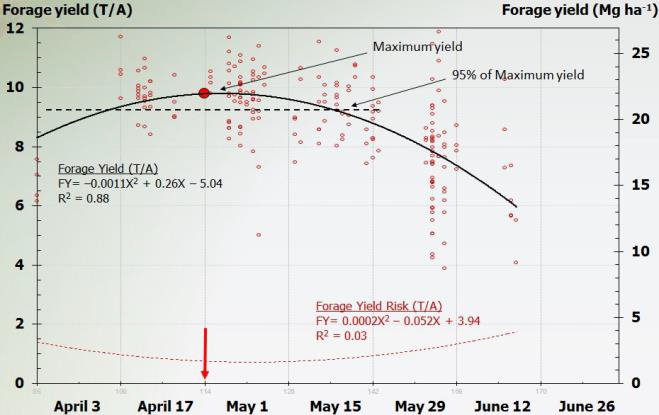 Corn forage yield response of full-season hybrids (104-108 RM) to planting date during 2003 to 2012 at Arlington, WI (N= 235 plots).